I took the trail to the river because I wanted to see open water again after nothing but solid ice on the lakes, brittle frozen brush, and snow that felt like sand. I wanted to see something moving and alive and listen to the gurgle of water as it rippled its way around the rocks of some open place that had never quite closed. The snow was unbroken, and the jack pines were so heavily laden that their branches touched the ground. Not a sign of life anywhere until I approached the river and saw the delicate twin tracks of a weasel weaving in and out of the underbrush. The tracks disappeared at the base of a protruding stub—gateway, I knew, to the jungle of grass and duff underneath and the meadow mice that lived there. Then for twenty feet there was no sign until the tracks emerged through a tiny hole in the snow and continued on in a straight line to the open water. I skied to the very edge of the riffle and stood there, feasting my eyes and ears. Moving water after thirty or forty below when the whole world had seemed a frozen crystal of blue and white was an exciting thing. It was then I saw the weasel standing on a log just below me. Snake-like in shape, this tiny bit of venom was less than a foot in length. Totally white with a faint tinge of yellow, the only contrast the jet-black tip of its tail and its beady eyes, the little animal watched me intently. Then it ran out to the end of the log extending into the water and stood there with one foot uplifted as though wondering whether to plunge in and make it to the other side or retrace its steps and face me. 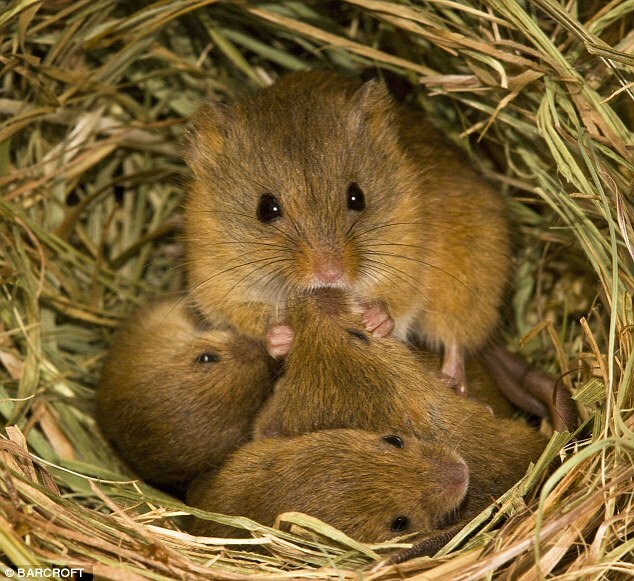 I sucked softly on the back of my hand, making a sound like the squeak of a meadow mouse. Instantly it turned and looked at me long and steadily, a picture of perfect control and poise. Again I squeaked. Throwing caution to the winds, the weasel dove for the end of the log and in a moment was circling the place where I stood. How impossible for any small creature to escape such speed and fluid grace, how hopeless to try and run from those smoothly rippling muscles, those sharp black eyes! Suddenly the weasel popped out within a foot of my skis and gave me a wholly malevolent look as though knowing of my deception; then in a flash it was speeding down a fresh rabbit runway through the alders. There is poetry in the way a weasel can flow through a maze of branches and grass—the liquid movement, the perfect control that enables it to live off those less agile than itself. "Duff" is leaf litter covering soil. 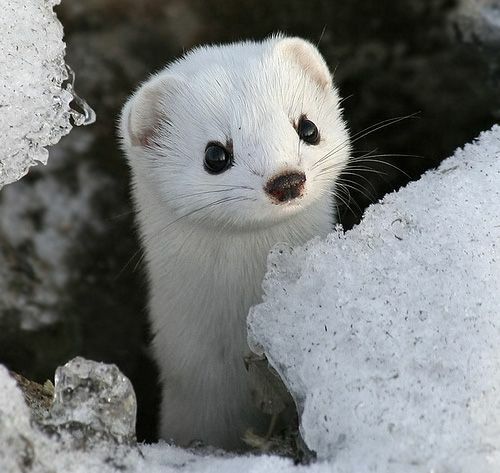 Ermine, (Mustela erminea), also called stoat, short-tailed weasel, or Bonaparte weasel, are widely distributed across North America and Eurasia. The species is called ermine during its winter white phase. Ermine pelts were used historically in royal robes in Europe. Learn more.